(Update): Gift the Apple fan in your life (including yourself) a $100 iTunes Gift Card for $85 w/ free email delivery from Paypal (15% off). In today’s best game/app deals, we have a pair of Black Friday-worthy console bundle deals for Xbox One S and PS4. First up, GameStop is offering the Xbox One S Gears of War 4 Special Edition 500GB Console Bundle with an extra Xbox One White Controller and a $30 GameStop Gift Card for just $249.99 shipped (nearly $400 value). If you’re not interested in this particular bundle, Amazon is still offering a series of Xbox One S console bundles with an extra game and a $30 Amazon gift card starting at $249 shipped. 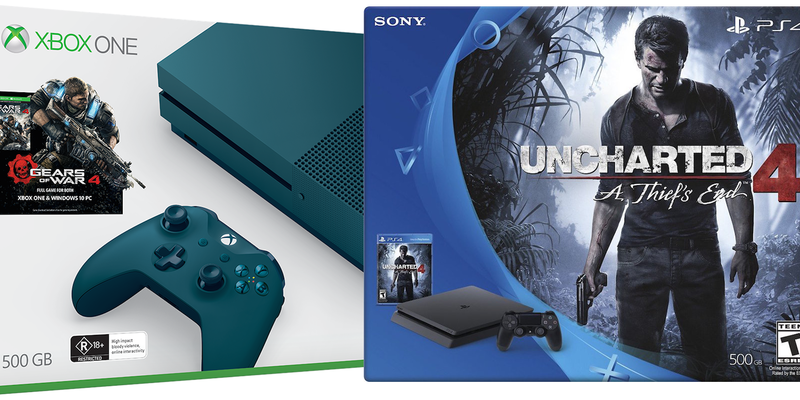 Over at Best Buy, you’ll find the 500GB PlayStation 4 Slim Uncharted 4: A Thief’s End Bundle with a $50 Best Buy Gift Card attached for $249.99 shipped ($350 value, current best price). And we also have some notable console deal options available in today’s Target sale. Super Mario Run is now available as a free download on the App Store, here is the latest Free App of the Week and make sure to hit up our Gift Guide for the best ideas for gamers. The award-winning action RPG Bastion is just $1 on the App Store (Reg. $5) and Tengami is just $2 (Reg. $5). Down below we have one of the most extensive and notable lists of discounted iOS apps/games of the year. Enjoy! Super Mario Run is now available as a free download on the App Store. But that will only get the first three levels. You’ll need to drop $9.99 to unlock the entire experience. Grab these free Mario Run Messages stickers while you’re at it.